Quick, easy meal. I did not have any chips so I sliced up some flour tortillas into strips, sprayed them with some olive oil, sprinkled with salt and baked until golden brown. I also bought dry pinto beans with intentions of cooking them for the salad, but it didn't happen. I used a can of refried beans that had been sitting in the pantry for awhile instead . Not a bad meal. This is my new favorite meal. This is the second time I have made it and I think it is very yummy. The dried apricots and pine nuts give it a very interesting taste. The meal seems light, but filling and satisfying at the same time. I ended up making a stir-fry adapted from Mark Bittman's Cookbook How to Cook Everything Vegetarian. 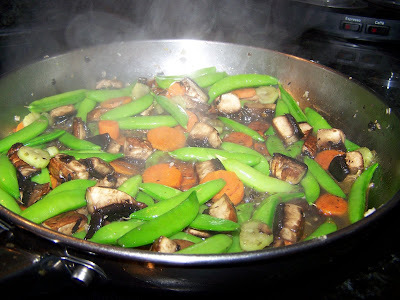 I used sugar snap peas, portabello mushrooms, carrots, and celery. I thought it turned out pretty well. I used a little too much soy sauce, but it had a good taste. You just can't go wrong with pizza you just pop in the oven. I have to admit it is a huge relief to not have to do any preparation for dinner. I do prefer Amy's Pizza.